HDRI and laserscanning the pyramids of Tikal. In the forests of Guatemala’s El Petén region lie the ruined cities of one of the world’s great ancient cultures, the Maya. Tikal was the largest and one of the most important urban centers of Mayan culture during its time, around 500AD. The massive ruins are concentrated at the center of the Tikal National Park (222 square miles), 40 miles from the city of Flores. Tikal is part of the Mayan Biosphere Reserve and is the only region of the world that has been declared both Cultural and Natural Patrimony of Humanity by UNESCO. Today, visitors to the largest excavated ancient Mayan city can begin to imagine what it was like at its peak, when it sustained some 200,000 people within its 30 square miles. Around 870AD construction slowed, likely due to overpopulation and the resulting destruction of forests, soil and other resources, and by the 10th century Tikal was completely deserted. The ruins were officially discovered in 1848 and restoration began in the 1950s. The Ruins area is about 10 square miles, a small percentage of the site. The fraction of Tikal’s estimated 3,000 buildings that have been excavated reveal temples, shrines, ceremonial platforms, small and mid-sized dwellings, ball courts, terraces, religious monuments with hieroglyphic inscriptions, causeways and plazas, most interconnected with aqueducts. Only about a dozen have been reconstructed or excavated to any degree while the vast majority is high mounds covered with lush vegetation. Tikal is also a nature lovers paradise boasting 285 species of recorded birds, hundreds of orchid species and more than 30 hardwood species. Wildlife abounds: howling monkeys, toucans, hawks and parrots are home in the subtropical jungle, amidst trees measuring up to 150 feet in height and endless hanging vines known as lianas; Jaguar, puma, Occidental turkeys, ocelot and snakes can also be found. Greg Downing, an expert in panoramic and HDR photography, had just finished work on the movie Narnia when he was approached to work in Tikal, primarily to shoot HDRIs that will be used in conjunction with a laserscanning project for UNESCO. In our interview Downing discusses the nature of and his involvement with the project, how 3D modeling and laserscanning were used, and the obstacles unique to jungle photography. How did you get involved with this project for UNESCO? I just got a call one afternoon from Anthony Fassero and John Ristevski, who were both involved with CyArk and UC Berkeley. They were researching Image Based Modeling techniques on the Internet when they came across the VRMAG articles, which led them to my Gnomon DVDs. After watching the DVDs they decided to contact me to see if there was a way we could work together. As it turned out the timing was just perfect for me. I had just finished up my lighting work on the Narnia movie and had a few months break before my new job on Spiderman 3 at Sony Pictures Imageworks started. I thought that the project sounded perfect because it combined all my interests: travel, world heritage work and, of course, finding new ways to stretch panoramic photography. How long did you spend in Tikal? We ended up spending a week on laserscanning and photography. Unfortunately, we had bad photography weather the first three days, which was the amount of time we had planned for the photography. Luckily, since I was just planning more Central American travel after the shoot I was able extend my stay and we had three more days of great weather, it was worth waiting for! I shot 11,000 photos with my new 5D during that time. I really was going though the CF cards a lot faster than usual since I was including the HDRI and timelapse. As Anthony Fassero explains it, the original goal for UNESCO was to demonstrate the feasibility of coupling panoramic photography and laserscanning for preservation purposes. The laserscan captures very accurate surface geometery in the form of point that then can be used to create plans, elevations and other construction documents. The photographic data registered on the scans increases the detail that can be extracted. For instance, an image might reveal cracks that a laserscanner might miss due to the laserscanner capturing a million points and a photo capturing 13 million pixels. Since panoramas capture a complete view they make the workflow more efficient, requiring the registration of only one image instead of many. How will the 3D model be used? Once the data was collected and the panoramas are married to the geometric data we are able to use it in many different ways. We can create flythoughs, for traditional animation, view on the web, dome theater production, Virtual Reality experiences, etc. The scans are accurately georeferenced using GPS and traditional survey techniques, allowing indexing into databases or other research tools. The media will be provided in different forms depending on the audience. Researchers may get the raw point clouds that the laser-scanner produces, Site managers may get 2D plan views, and a presentation to the general public would probably be Panoramas, Time-lapse and full 3D geometry with photo textures for the most realistic looking view. This animation may need a little explaination. It does not have any geometery or the "wireframes" of traditional 3D, it is simply the 3D points that the laser scanner collected and then each point is colored based on photos that were "calibrated" into the scene. This allows a much faster workflow and is suitable for many visualization purposes. It has the added advantage that it maintains the accuracy of the original scan and because the points are colored from a photo is easily "readable", ie you can tell which points belong to a tree vs. an architectural subject. Later we will do a higher quality render that will use 3D geometery made from a fewer points that will have images projected onto them as a texture. This second approach will be closer to a photoreal appearance that you might expect to see in a movie and will not have the holes that you can see in this render. What exactly is ‘laserscanning’ and how will it be used? I’ll let John Ristevski explain this one: High definition 3D scanning can, in general terms, be defined as any instrument that collects 3D data of a given surface or object in a systematic, automated manner, at a relatively high rate and in near real time (Boehler and Moebs 2001). This excludes many traditional survey instruments that do not meet these three requirements. Traditional methods such as tapes, theodolites and more modern technology, such as total stations and GPS, provide accurate but relatively slow and cumbersome methods for gathering spatial data (Addison 2001). High definition survey can thus be distinguished from traditional survey by the rate at which the physical world is sampled. High definition survey devices such as laser scanners are able to sample at rates that were previously impractical, resulting in high definition data and, correspondingly, very large datasets. 1. Time of Flight: A technique by which a laser pulse is emitted from the instrument and the time of flight is measured, from which the distance to the object can be determined. 2. Phase Comparison: The instrument emits a stream of light with a known frequency and phase and by comparing the emitted phases to the returned phases the distance to the object can also be determined. 3. Triangulation: This system utilizes two sensors that simultaneously record the reflected laser pulse and determines the dim. Three-dimensional scanning can be broken down into two classes of instrument based on the optimal distance of the sensor. Long Range LIDAR technology was initially developed as a tool for the creation of as-built drawings in complicated retrofit and construction projects such as oil refineries (where the intricate infrastructure would render traditional surveying techniques inadequate). Typical distances of long range systems range from a minimum of one to two meters to a maximum distance in the hundreds of meters. The table below gives the specifications for the Cyrax 2500 system, which is a typical long-range scanning system that is widely used today. This range and resolution makes long range scanning systems perfect for the recording of architectural scale features and objects. The use of 3D scanning in cultural heritage is relatively new, but is equally applicable to the technique. Can you tell us about the structures you were documenting? The structures we were documenting were pretty amazing. 1886 when the Iowa State Capital was built. Most of the Pyramid is completely buried in jungle; in fact, it looks like a large hill with the entrance and temple cone sticking out of the top. They are planning on excavating the Temple and wanted complete documentation of the site before it is done. You can see from the aerial photo that there is scaffolding going up on the backside and to the top of the pyramid where they are currently restoring the structure. Once the reconstruction is complete I don't think anyone will be going up here for a very long time. I am looking forward to the day when I can go back and photograph it again when it is fully excavated and reconstructed. Although UNESCO's interest was in collecting the data for Temple IV, John, Anthony and I were much more interested in the already restored Gran Plaza and surrounding acropolises. The Gran Plaza has two main pyramids facing one another, Temple I is now closed to the public due to the hazards of climbing it and the damage that is done to the limestone steps when people climb it. The stone was very soft and crumbly. The site manager had to make a decision to allow us to climb it, the justification was that the documentation we were collecting would help them preserve the structure in the future. Temple II, which faces Temple I now, has wooden scaffolding for stairs and a viewing platform on the top protecting tourists and the structure from damage. This is great because it allows visitors to see the site from a high perspective but unfortunately does detract from the vision of what Temple II must have looked like long ago. On the north and south sides there are Acropolises. These are raised areas that have other structures. On the south side is what is called the Central Acropolis. 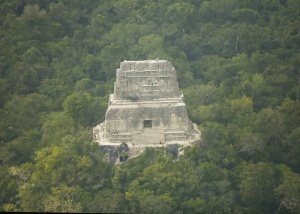 This is where it is believed the Mayan Royalty and Priests lived. The North Acropolis is where there once was a third pyramid that was excavated in the 1960s. The process of excavation, unfortunately, can be destructive. In order to reveal older structures more recent ones are destroyed as you dig through them. The Mayan had simply bricked over previous structures, as the new structures got larger. They believed that they were burying their gods and holy places, allowing them to rest in peace when they built something new. The excavation of the pyramid reveals different parts of different structures from each age where there was significant construction. You can see in the photos that there are many rooftops made from palm leaves. These protect the sculpted limestone of what they have excavated. What particular obstacles did Tikal present? John had to drag a 75lb $30K laser scanner up and down 70-degree inclined crumbling steps of pyramids. The weather was difficult. The first three days were bright white hazy skies that were always blown out and there was often condensation collecting on the lens. I also ran into an unexpected problem when I got some Deet on my lens. There are tons of mosquitoes and some carry malaria so you pretty much have to lather on a lot of the undiluted insect repellent Deet. Sometime in the first day I got a tiny bit of it on my UV protector in front of my lens. I continued to clean my lens and only pushed it around; unfortunately, this with the bright skies ruined several thousand photos before I figured out what was happening. When I cleaned it more thoroughly I was able to remove it. The other big problem was technical. I was also using one of the new Epson 4000 image storage devices. There was a firmware bug at the time in the 5D that caused it to write a 1.6-gigabyte file. I transferred it to the Epson device; this somehow jammed things up for the Epson and could not remove it or the other images on it for the rest of the trip. So I was unable to dump it onto a laptop in the evenings so this ended up being useless after the second day so it was back to lugging a laptop around with me everywhere. Once the weather cleared the afternoons had really wonderful cumulus clouds floating by, but the wind was blowing them really fast so it made some of the skies pretty tricky. It did make for some wonderful time-lapse though. What was your contribution to the project Greg? The laserscanner recovers very accurate 3D points that can then be turned into geometry. My skills were to identify the correct angles for best texturing the geometry and general photographic expertise. I shot HDRI mainly in the darker interiors so that when we transition from the interior to the exterior in 3D that we get a nice simulation of how your eye would react if you made that kind of transition. I would have liked to have captured all of the images in HDRI but I also wanted to make sure that we had enough resolution to get very accurate and high resolution texture mapping from them for rendering, so for time purposes most of them were not full HDRI, they were three images bracketed with two stops in RAW or even single exposures with a 40 shots and a 35mm lens. I also brought a 200mm L zoom that I used to get gigapixel plus mosaics of the various structures. Kind of a poor mans Pixorb, just mounting the lens and moving the camera manually in very small increments. Most of these will work but there were a few gusts of wind that blew a few pictures, those will probably take quite a bit of work to recover. How does Tikal tie in with your upcoming dome theatre presentation in Denver? While I was there I was also planning for the dome theater show I have coming up in Denver on Feb 15th and 16th. This will be very similar to the show I did in February 2005, only this time, in addition to panoramas of Tikal and other locations, I will be showing some 180-degree surround time-lapse. A fisheye lens will map back onto a dome perfectly so just shooting time-lapse with a full circular fisheye can yield some pretty impressive results. I shot some sequences from the tops of the different pyramids when the clouds started rolling in at the end of the day. Also, because there are fisheye lens shaders available for Maya (the 3D program, not the indigenous people of Tikal), in the future, if an opportunity arises, it would be possible to render out scenes from the photo textured laser-scans or image based models for a full-dome environment. What were your personal impressions of Tikal? I had some great Indiana Jones like experiences while in Tikal. First off, it was just cool to get to climb and go inside of the pyramids. Having the place all to yourself for a few hours was a real luxury for me, I am so accustomed to either having to shoot fast because it is not exactly being done with permission or having to work around tourists blocking my view. The park removed the gates to the entrance to the pyramids so we could get inside. It took about 30-40 minutes to shoot an 11 exposure 18k HDRI in the interior. There were geckos on the white walls and I had an opportunity to inspect some of the ornate carvings on bits of wood that were left in the interior. My second experience was something else. In the north acropolis some of the excavations are pits where they have dug down to earlier civilizations. There is a railing that keeps visitors out of the pits but I was able to go down into one to photograph an eight-foot mask of Chaka, the rain god. In ancient times he would have been covered with plaster and painted. While in the pit shooting a high-res HDRI, I noticed there was a four foot high tunnel leading off into the darkness that could not be seen from the top of the pit. I yelled up to one of the archeologists working in the park asking him what the tunnel was. He told me that I would like it and that I should explore it. I had an LED headlamp in my pocket and proceeded to check it out. What he didn't tell me was that the ceiling would be covered with bats hanging upside-down so I had to move my hands in front of me to get them to flit out of the way. After a few feet, I was noticing that there was a lot of movement on the walls, they were covered with what I think were tarantellas, or at least very large spiders. I proceeded about 20-30 feet down the tunnel and it made an abrupt turn and opened up so that you could stand upright. There was a twin chaka mask inside, only it was in much better condition since it had been sheltered from the elements. Unfortunately, I did not come prepared to do interior lighting and the 5D I was shooting with doesn't have a flash, so I wasn't able to photograph it. I was feeling quite proud of myself for making it past all the creepy critters until the archeologist and his 10-year-old son followed me in. I was a little disappointed the kid didn't even shudder. Insects and wild life were a big part of the trip. I was anticipating the beautiful ruins but was also pretty impressed with all the wildlife in the park. I got some great audio recordings of the birds and howler monkeys using my camcorder. There were very colorful Toucans flying around (see pic) and other birds I couldn't identify. The howler monkeys could be heard for miles and sounded something like you might imagine a wheezing tyrannosaurus rex might sound like. They started around 4 am outside my window every day I was there. There were some very furry anteater-like animals and what I believe was a tapir, it looked like a cross between a gopher and pig to me. They call Tikal the land of eternal spring; I was buying it. The foliage was really lush and green and there were thousands of butterflies of impressive size and color; I saw one that had maybe an eight-inch wingspan. There were lots of dragonflies, leaf-cutter ants and fireflies at night. Probably the most impressive thing I saw was a strange centipede. John, Anthony and I were walking to dinner one night and we saw what looked like a downed firefly in the road. On closer inspection we saw a big glowing dot moving across the pavement, followed by tracing lights that were moving in a serpentine pattern. It was a centipede that had a glowing head and would send pulses down it's segments as it would crawl and each segment had a pair of glowing dots that it was controlling in a pulse. I had no idea that such things even existing in nature!